Located in part of the Hirsel Estate – the ancestral home of Lord David Douglas-Home, son of the former Prime Minister, Sir Alec Douglas-Home – the course is laid out over rolling Borders terrain right on the border between England and Scotland. Although founded in 1948, it took another fifty years before members of Hirsel Golf Club were able to play on a full 18-hole layout when the course was extended to its present 6,024 yards. The River Leet features on several holes, though its presence is pleasing to the eye rather than threatening. Of more danger is the out of bounds to be found at no fewer than eleven holes on the card. There are also a few blind tee shots and blind approaches to contend with around the course, adding interest to the round. The four par three holes are worthy of mention. The first on the front nine is the 3rd; a 243-yarder called “Bell”. It takes a fair old blow from the tee to get close as the hole plays uphill and the green is entirely blind. The next two short holes – “Kingfisher” and “Spa Well” – are the 7th and 10th which are both protected by water to the front of the green. The 177-yard 14th, named “Cheviot” plays to a two-tiered green with three bunkers in front. Conditioning of the Hirsel course is famed, so much so that some who should know a good course when they play one have called it “the Augusta of the Borders”. We played The Hirsel GC back in 2012 and enjoyed our day however the course wasn't in very good condition, we returned last week to play and what a difference 2years makes the greens were smooth and fast and the best of our 5day trip, fairways were stripped and the rough was thick but fair. Staff were very helpful and the Pro even told us how to play the first few holes. Well done a Hirsel, huge improvements. 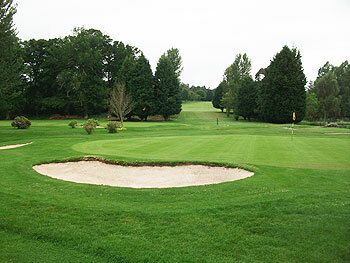 A fantastic golf course that tests your course management as well as your ability to manufacture shots from every lie. I really don't understand how Coldstream gets away with using the ridiculous 'Augusta of the North' moniker. For a start that must be a copyright infringement but from a golfing perspective it's outrageously inaccurate; mickey-mouse holes more akin to a pitch n putt in places - getting round in 70 isn't that difficult even when the course is wet and soggy. There are very few decent courses in the Borders but this isn't one of them; Duns, The Roxburghe, Torwoodlee and Peebles rank far higher as true golfing experiences in the area. With the Hirsel's yardage reading pretty much the same as Duns, Torwoodlee and Peebles lets starting throwing pitch and putt comments round too. Like most inland courses The Hirsel does get damp but in 2013 has been on full greens throughout and never been shut due to rainfall. 70 is always a good score round this picturesque course, I highly dought the owner of the above comment has the knowledge or skill to beat the par round Hirsel! I thought I'd add to the debate although it was back in May this year that I had the chance to play here. I thought it was a bit pricey for the area and for what it was in a part of the country where Goswick offers greater value and is a past Open qualifying venue to boot! Like others have said the whole comparison with Augusta (assuming the denizens of Coldstream mean THE Augusta) is all rather out of place an 'gilds the lily' more than just a touch. I was expecting, like others who reported here, it to be more special than it actually was and wouldn't venture back. One star might seem harsh so I'd give it two but with 7 holes of less than 350yds off the back tees it's certainly nothing special with no real trouble to get into. My four-ball included two of us playing of handicaps of 3 and we skirted round quite easily with scores of 75, 71, 70 and 68 - and that's without any gimmes!! All-in-all my playing partners and I felt more than a little bit conned by the Augusta reference; Hirsel isn't in the top 200 of courses in Scotland. Sorry guys but you set expectations way too high. The clubhouse staff were friendly though. Me and my golfing buddies enjoyed a fantastic trip to the Borders this year and The Hirsel was a great little hidden gem, especially using the Tuesday deal of £18.00. Great value for money, it was the best priced in our trip to the Borders and the greens were firm and smooth. Not the longest, but plenty character and well maintained. Already booked up for 2014 on great little package. 3/4 stars for us. Hirsel made a recent surprise appearance in a golf magazine’s Top 100 list of Scottish courses so I just had to venture down to the border with England to see what was so special about this place. Because it’s laid out on four separate parcels of property, the course has a slightly disjointed feel as you have to make short walks across bridges and a road to play a number of holes in each sector. The opening two short par fours ease you into your round before you face an uphill par three hole that plays blind to a green all of 243 yards from the back tee position – once you get over the absurdity of this hole, you can rest assured the other three short holes are going to be a tad more conventional in layout! Two of what appear to be newer holes on the course at 5 and 6 are good, left dog legs in a little loop that brings you back to tee across the River Leet as it winds its way through the estate at the lovely short 7th. The beauty of this lovely par three is surpassed however by the 10th, where a 98-yard tee shot is played from a vertiginous position 50 feet above a green that sits on the other side of the river. Some might think it too quirky but I must say I liked it as it reminded me of my formative golfing years back in the 1970s playing the “Wee Drap” 12th at Clydebank’s municipal course (… those were the days…). The back nine contains two par fives (at 12 and 18) that contribute to a yardage that’s 400 yards longer than the front nine but the newer holes across the road from 12 to 15 never really took my fancy, mainly because the longer par fours at 13 and 15 seemed too out of step with those that had been played earlier in the round. The closing three holes are very good, played out over wickedly undulating terrain and they round off the routing in fine style. As the previous reviewer stated last year, Hirsel is a decent members club. As to whether it merits its recent claim to fame amongst the upper echelons of Scottish golf courses, I’m not so sure – maybe you should avail yourself of one of the club’s excellent twilight green fee offers and judge for yourself. I’ve played Hirsel quite a few times and it’s not the best course in wet weather, as it does tend to get soggy underfoot. However, I think the review below is a bit harsh and Hirsel is not only a pretty course but also fairly challenging despite its quirky 90-yard par three 10th called ‘Spa Well’ which would benefit from a few yards extra length. At only 6000 yards it’s certainly not long but after 18 holes you’ll feel the effect, as there are plenty of ups and downs. I doubt the commentator who called it the Augusta of the Borders had ever been to Georgia. It’s a shame that Hirsel is marketed on a comparison to one of the world’s most highly conditioned courses because it sets an unrealistic visitor expectation. I’ve never played Augusta but I’ve watched enough of the Masters to know that Hirsel is not in the same league but Hirsel is a decent and friendly members club. 'The Augusta of the Borders'!!! I don't think so. With this tag in my mind I was really looking forward to playing here. What a letdown! Apart from a couple of holes where the river is in play this is as as bland a course as one could imagine. Avoid! !